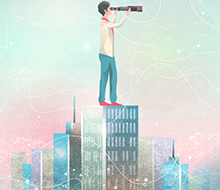 For today’s youth, the future of work may be more uncertain than ever. The confluence of two digital forces will dramatically reshape tomorrow’s workplace, leading to a sharp reduction in the traditional employer-employee relationship. New platforms allow economic activity to be organized in ways that shift much of what was traditionally accomplished by full-time workers within an organization to a crowd of individual entrepreneurs and on-demand workers. The result is an economy that increasingly relies on short-term freelance relationships rather than on full-time employment. enabled technologies are getting increasingly better at the cognitive and physical tasks that comprise much of today’s work, presaging the automation of complex human activities like driving a vehicle or managing a project and disrupting a range of occupations that include law, consulting, retailing, and transportation. The confluence of these two factors leads to a labor market in which full-time jobs may be broken up into tasks and projects. This will make it easier to substitute capital in the form of automation technologies for human labor and talent, a trend that will be reinforced by the diminishing power of labor unions. Society and government will have to keep pace with these changes in work arrangements. To avoid further increases in the income and wealth inequality that stem from the sustained concentration of capital over the past 50 years, we must aim for a future of crowd-based capitalism in which most of the workforce shifts from a full-time job as a talent or labor provider to running a business of one—in effect a microentrepreneur who owns a tiny slice of society’s capital. As fewer people earn a living in the way now considered traditional and many, if not most, face changes several times during their careers, the emphasis of education must also shift (see “Education for Life,” in this issue of F&D). Instead of focusing primarily on two- or four-year postsecondary institutions that educate early in life, as we did in the 20th century, society must create robust educational institutions that help workers make midcareer transitions. Moreover, the largely employer-funded portion of the social safety net—which often includes medical insurance, paid vacation time, workplace insurance, retirement contributions, and predictable salaries that stabilize earnings—must be rethought in an era of greater individual entrepreneurship. 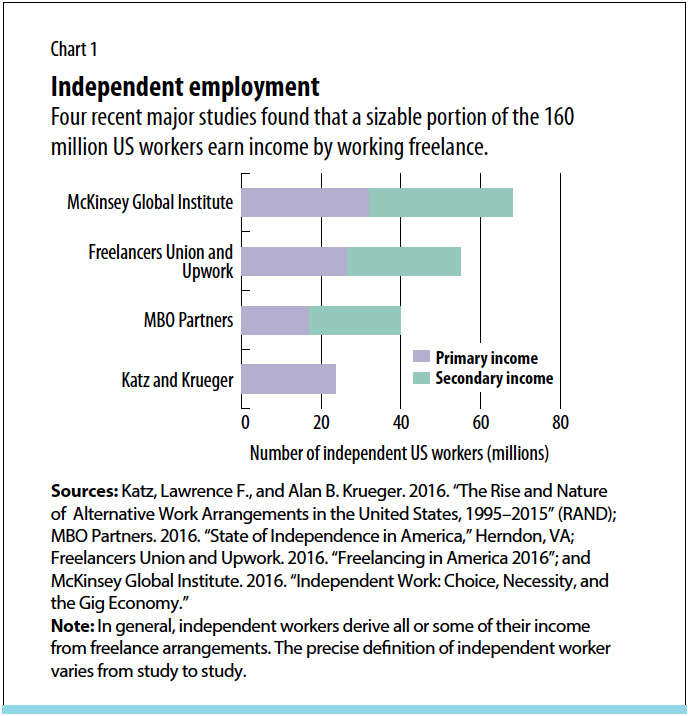 Several studies over the past two years have documented a rise in the nonemployment labor force: people who derive their primary or supplemental income from freelance arrangements. 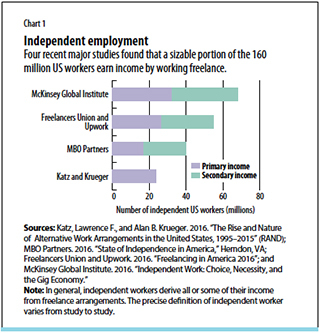 Estimates of the total number of such independent workers in the United States range from 40 million to 68 million (see Chart 1). The variation reflects different definitions and methods; nevertheless, both the high and low estimates demonstrate that independent workers represent a significant fraction of the country’s civilian labor force of 160 million people. The tendency to pursue nonemployment work is more pronounced among younger people. For example, 40 percent of independent workers who make their primary income this way are millennials, compared with about a third of the overall civilian workforce, according to a survey by MBO Partners. The emergence of numerous digital platforms that facilitate earning nonemployment income is likely to accelerate this trend. Many of these platforms commercialize personal assets by putting them to more productive use. These include transportation platforms (like Uber and Lyft in the United States, Didi Chuxing in China, BlaBlaCar in France, Ola in India, and Grab in southeast Asia); those like Airbnb that enable individuals (over 3 million at the end of 2016) to run a commercial short-term accommodation business in their home, and peer-to-peer car rental platforms like Drivy in Europe and Getaround in the United States. They also include a growing number of on-demand and freelance labor platforms like Upwork, which operates globally and has more than 12 million registered freelancers offering skills ranging from administration and customer service to web development and accounting; country-specific platforms like CrowdWorks in Japan (over a million workers) and Giraffe in South Africa; and sector-specific professional labor platforms like Catalant for management consulting, Gigster for high-end software development, and UpCounsel for legal services. A November 2016 JPMorgan Chase Institute study documents the change: at the end of 2013 about 0.5 percent of US adults had earned nonemployment income via such platforms; by mid-2016, that number had grown to 4 percent. Although there are no comparable global estimates, an October 2016 study by the McKinsey Global Institute documented a similar percentage: about 4 percent across France, Germany, Spain, Sweden, and the United Kingdom. Nonemployment work arrangements will expand further in coming years as sector-specific professional labor platforms proliferate, possibly taking full-time jobs out of companies and converting them into sets of projects or tasks. That will shift the source of commercial trust toward digital systems and increase the role for new enterprise software from companies like WorkMarket and SAP that manage complex on-demand task-based workflows. Concerns about this on-demand technological onslaught on full-time employment are exacerbated by growing worries about labor automation made possible by advances in artificial intelligence and robotics. Of course, fears of technological unemployment are hardly new. In the so-called Luddite labor riots between 1811 and 1816 in Britain, textile workers destroyed weaving machinery they believed would replace their role in production. This report was not prepared for President Barack Obama in 2016. Rather, it was presented to President Lyndon Johnson 50 years earlier. 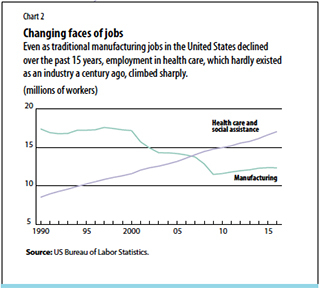 And although exaggerated in its prognosis, it was accurate about the long-term source of manufacturing job losses. Although US manufacturing employment continued to rise in the decade following this report, peaking at close to 20 million jobs in the late 1970s, it began to fall soon after. Manufacturing jobs represented 22 percent of nonfarm payroll employment in 1977. In contrast, the 12 million manufacturing jobs today account for less than 10 percent of nonfarm payrolls. 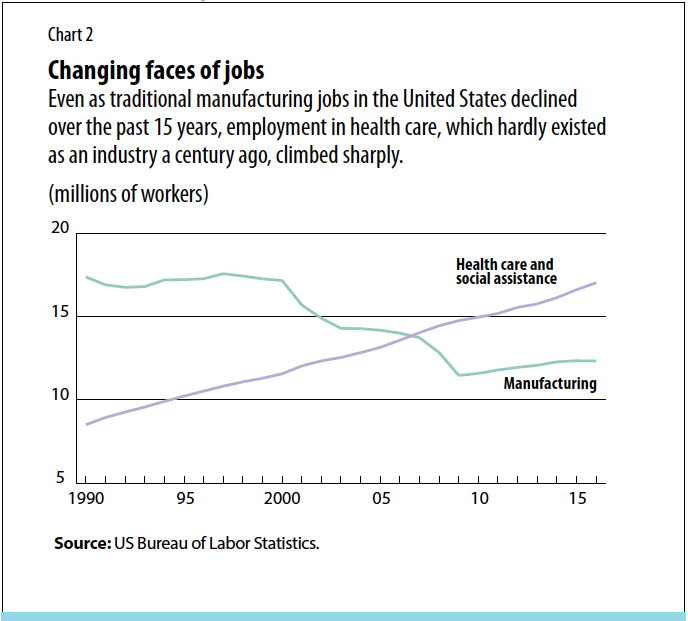 Although it is difficult to precisely disentangle trade effects from those of technological change, many believe that those US manufacturing job losses over the past 15 years reflect factory automation more than companies shifting production to low-cost foreign operations. In fact, even as jobs were declining, US manufacturing output was growing. As robotics technologies continue to improve, automation may be even more ominous for China, where urban manufacturing employment was at a massive 80 million in 2014, a level bound to drop steeply in coming decades. Perhaps what strikes greater fear than manufacturing automation among today’s youth is the specter of the “second machine age” predicted by Erik Brynjolfsson and Andrew McAfee in their 2014 book, in which technologies start to perform the cognitive tasks once the exclusive domain of humans. IBM’s Watson technology promises artificial-intelligence-powered solutions for financial compliance, medical diagnostics, and legal services. Self-checkout counters at a growing number of retail stores already replace cashiers. Self-driving automobile technologies seem poised to threaten tens of millions of trucking jobs globally. These professions span the expertise spectrum, which portends a slowing or perhaps even reversal of wage increases for high-skill work that have accompanied skill-biased technical change in past decades. Furthermore, many worry that if machines go beyond automating physical labor and start to absorb the demand for cognitive capabilities as well, little will be left for humans to do. A glance at the history of job displacement from automation provides some context and reassurance. As farming was steadily mechanized in the United States, the share of the workforce employed in agriculture fell from 41 percent in 1900 to less than 2 percent in 2000. Yet the specter of economy-wide unemployment did not materialize. Rather, progress in the underlying technologies themselves spawned new industries. As David Autor pointed out in a 2015 article in the Journal of Economic Perspectives, as passenger cars displaced equestrian travel and its supporting industries, the automobile industry emerged—along with highways, gas stations, the roadside motel, and fast-food outlets. The broader point is that even as old industries shrink or disappear, new ones that fulfill different human desires and needs emerge and expand. The health care sector, virtually nonexistent 200 years ago, accounts for about 12 percent of US employment today (see Chart 2). Tourism, barely an industry in 1900, employed 235 million people in 2011, constituting 8 percent of global employment. A pattern has emerged of activities once informal or done within the household or local community (like communication, entertainment, travel, education, or tending to the ill) becoming industries in the formal economy. As the labor demands of industries that fulfill contemporary societal needs are automated by new technologies, people will be free to fulfill underserved human aspirations or new societal needs. Perhaps economic activity to counter climate change will scale up dramatically—or to educate the world or formalize the care economy. So the myriad projections about the big chunk of today’s jobs that might be amenable to automation in coming decades are not cause for widespread and immediate panic. But the confluence of the twin forces of rising nonemployment work and the increasing cognitive capabilities of machines could call for a change in society’s model of earning a living. This is because the labor displacement effects of automation are moderated by differences in how quickly it lowers the cost of doing different tasks that comprise a job. If organizations start to unbundle jobs and farm out tasks to on-demand labor platforms, the effect will be faster automation of such tasks when the technology is ready. One solution is to redefine our basic model of how people earn a living: away from payment for labor and talent by a large organization that owns the capital associated with the economic activity and toward a system of tiny businesses that mix labor, talent, and capital inputs. Some inputs might come from the individuals themselves and some from other humans (perhaps via an on-demand platform); over time, a growing share might come from artificial intelligence and robotics technologies. The emergence of sharing economy and other professional services platforms makes this future of crowd-based capitalism feasible at scale. Perhaps the best example is Airbnb, which matches owners of spare space with those seeking temporary quarters. By many measures, it is the world’s single largest provider of short-term accommodations. (On December 31, 2016, more than 2 million people around the globe were staying in Airbnb housing. The world’s largest hotel chain, Marriott-Starwood, has an inventory of roughly half that, or 1.1 million rooms.) Airbnb gathers demand for space, provides the reassurance that comes with a global brand, and sets and enforces some standards (almost like a next generation franchising operation). But the actual running of the businesses that provide the short-term accommodations—the pricing, inventory management, positioning, merchandising, customer interaction—is done by the 3 million hosts, who build their own microbrands through Airbnb’s reputation system. Airbnb could be a microcosm of the future of work—relatively immune to the displacement effects of automation. In younger and faster-growing economies, like those of Brazil, India, and Vietnam—where full-time institutional employment is not yet dominant and traditional economic institutions vary in effectiveness—platforms with robust digital trust systems that match demand for services with suppliers could stimulate a self-employed and entrepreneurial population, empower it to reach global markets, and raise its standard of living by building individual capital. In more mature economies, like Japan, the United Kingdom, and the United States, which now rely primarily on full-time formal employment, such a model could maintain reasonable levels of individual income. In essence, these changes could partially insulate the workforce from higher capital-labor substitution because of automation by helping today’s workers make the transition from labor provider to capital owner. In the future, today’s aspiring law associate might instead be a tiny law firm that operates through a legal services platform. That would give the young lawyer access to corporate clients the platform aggregates and cultivates while leveraging artificial-intelligence-enabled legal research capabilities. Microentrepreneurs might run urban transportation or local trucking businesses using fleets of autonomous cars or trucks through a platform. A global consulting firm might evolve into a platform through which millions of individuals run microconsulting practices (or even small partnerships). Such a future of large-scale crowd-based capitalism will require fundamental rethinking of postsecondary education. Countries around the world, most prominently the United States, have invested heavily in universities and colleges that prepare their workforces early in life for a career of full-time employment. Much of this focus must shift toward dramatically increasing the availability and quality of continuing education. Recent political developments in the United States and the United Kingdom reflect in part significant underinvestment in new opportunities for workers displaced by automation and ill equipped for a new world of work. To help those workers, new university-like institutions are needed to provide structured and pedagogically sound transition education. The instruction should be accompanied by a new professional network and access to new opportunities that help overcome the housing, credit, and community factors that often impede relocation to pursue a new career. Such an approach would give workers in flux a new identity and sense of purpose and enable them to rebuild their self-worth. Seeking this sort of midcareer intervention should be as natural as choosing to go to college after high school. The government of a country must lead the creation of such a system. It may also be prudent to reevaluate middle and high school curricula for the next generation. As the cognitive capabilities of digital machines expand, students may need less education in science, technology, engineering, and math and may benefit from a greater emphasis on design thinking, entrepreneurship, and creativity to prepare them for a microentrepreneurial career. At the same time, the social contract must be refashioned to accommodate a different kind of workforce. During the second half of the 20th century, a variety of labor laws were developed to improve the quality of work life for full-time employees—including minimum wages, overtime, and insurance. Funding for a number of other incentives—stable salaries, paid vacation time, workplace training, and health care—in many countries is based on an assumption of full-time employment and on the employer providing all or part of the incentive. The design and funding of tomorrow’s social safety net must be adapted for a workforce that is increasingly independent. At the same time, substitutes are needed for the career paths and sense of community many workers now get from the company they work for. Perhaps the role of the postsecondary schools will evolve to include this kind of lifelong career planning. The challenges facing today’s millennial workforce seem quite daunting. However, if society plays its cards right, tomorrow may offer a better place. As we have learned from Thomas Piketty his 2014 book, Capital in the Twenty-First Century, the most important driver of sustained inequality in modern economies is the concentration of capital ownership. Countries whose government policy steers an economy toward a future of genuine crowd-based capitalism and creates authentically decentralized capital ownership may also enjoy less inequality as a happy by-product. As digital machines compel us to reshape our world of work, perhaps they will also show us a path toward the more equitable society we’ve been seeking for years. Arun Sundararajan is a professor at the Stern School of Business, New York University, and author of The Sharing Economy: The End of Employment and the Rise of Crowd-Based Capitalism.